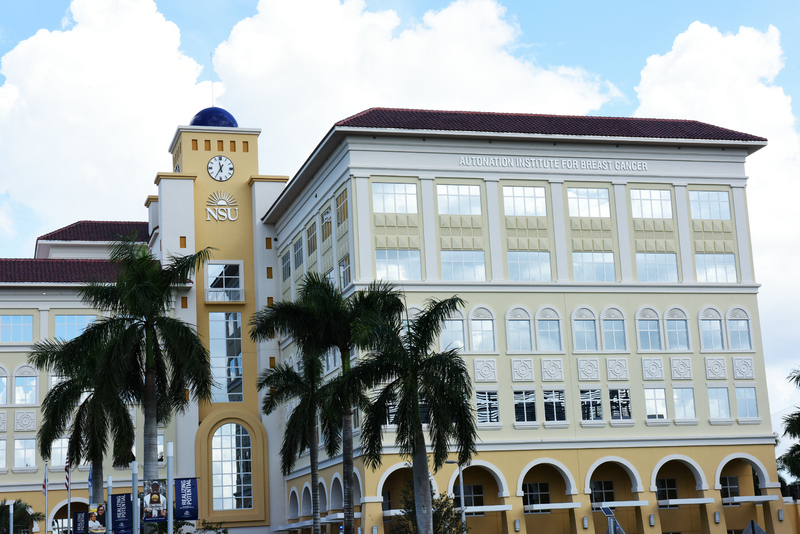 FORT LAUDERDALE/DAVIE, Fla. – Nova Southeastern University (NSU) officially opened its Center for Collaborative Research (CCR), one of the largest and most advanced research facilities in Florida. As part of the ceremony, which was held September 21, NSU announced a gift from AutoNation to name NSU’s AutoNation Institute for Breast and Solid Tumor Cancer Research, located within the CCR. The Institute is focused on developing and advancing improved methods of prevention and treatment to ultimately eradicate cancer. The gift to name NSU’s AutoNation Institute brings the company’s cumulative giving to NSU to more than $10 million. Indianapolis 500® Champion Ryan Hunter-Reay joined the festivities to unveil the new AutoNation/Hunter-Reay Research Lab, which is located within NSU’s AutoNation Institute. Hunter-Reay is helping support cancer research at NSU through his non-profit, Racing for Cancer, Inc. Located adjacent to the university’s Health Professions Division complex on NSU’s Fort Lauderdale/Davie Campus, the 215,000-sq.-ft., six-story CCR is equipped with wet and dry labs; state-of-the-art research equipment, including access to a high-performance computing environment; and other resources, such as Florida LambdaRail, a high-speed broadband service delivery network with connectivity throughout the nation. The CCR building has been submitted to the United States Green Building Council for review with the intent of receiving Leadership in Energy and Environmental Design (LEED) gold certification. The CCR took two years to complete and reflects an investment of nearly $100 million in Broward County. In May 2016, HCA East Florida received state approval to build a hospital on NSU’s campus. Design of the hospital is underway. Once completed, the new hospital will be within walking distance from the CCR and NSU’s Health Professions Division complex, providing opportunities to even further integrate research and clinical trials. “With access to HCA’s vast resources for clinical trials and opportunities to partner with private ventures, our university is poised to become a national and international hub for startups and established technology companies, resulting in high paying jobs and innovative discoveries,” said H. Thomas Temple, M.D., NSU’s senior vice president for translational research and economic development. NSU is classified as a national doctoral research university with “high research activity” by the Carnegie Foundation for the Advancement of Teaching. More than 200 research projects are currently underway at NSU, including studies on cardiovascular disease, anti-cancer therapies, chronic fatigue syndrome, autism, coral reef restoration, stem cells, disorders that cause blindness, wildlife DNA forensics, and more. NSU’s research programs are funded by the National Institutes of Health, U.S. Department of Defense, National Oceanographic and Atmospheric Administration, and other prestigious organizations and private supporters. About AutoNation, Inc.: AutoNation is America’s largest automotive retailer, currently owning and operating over 360 new vehicle franchises from coast to coast. AutoNation sold its 10 millionth vehicle in 2015, the first automotive retailer to reach this milestone. A commitment to delivering a peerless experience through customer-focused sales and service processes is what drives AutoNation’s success. AutoNation supports the Breast Cancer Research Foundation through its Drive Pink Campaign. AutoNation is transforming the automotive industry through bold leadership, technology and innovation.